Last week Lori over at Fake Food Free made Pecan Shortbread & it sounded so good I knew I wanted to make some right away. I had an idea to add dried cherries to them which Lori thought would work great. Now, these are not the fanciest cookies on the holiday cookies tray. Actually, they really look like plain janes up against the cookies covered in icing or filled with dark chocolate but these are the cookies I will reach for every time I walk by. 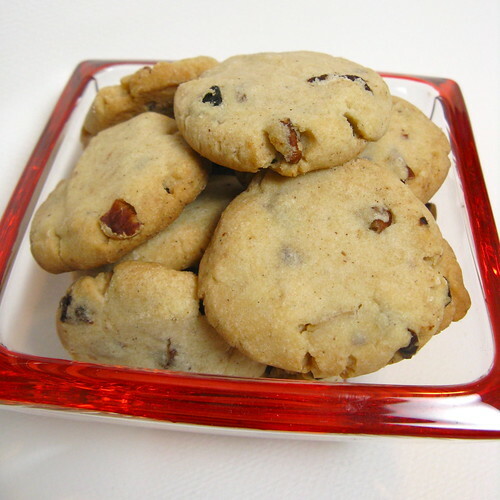 They are buttery & flaky with little bits of extra sweetness from the cherries. I also added a little clove, allspice & cinnamon to them to give them a bit of holiday spice. Lori's shortbread was much healthier than mine as she uses demerara sugar and whole wheat pastry flour. I don't have either of those items in my pantry & the snow storm kept me from going to the store so I adapted the Scottish shortbread recipe from Joy of Cooking for these. In a large bowl, beat the butter powdered sugar, sugar, salt, clove , allspice and cinnamon on medium speed until light an fluffy. Stir in the flour. Knead in the pecans & cherries until the dough comes together & they are mixed through. Line baking sheets with silicon pads or parchment paper. Roll the dough into 1 tablespoon (about 1/2 oz) balls. Place on the baking sheet about 1 inch apart. Press done with your hand to flatten. Bake for 18 minutes or until the bottoms are golden brown. Cool on a rack. kat... sometimes "plain jane" is the star of the show. I recently made your Peppermint-Chocolate Shortbread and they are absolutely delicious. So, I definitely can't wait to make a batch of these. Anything with pecans has to be good to an old southerner like myself. I love what you did with them. The spices with the cherries have to be so good! I'm honored to have provided inspiration. ;) And I agree with the above. Plain-Jane usually turn out to be darn-good. these are great--the jewel-like cherries are a perfect addition. These are very drool worthy. I jsut love shortbread cookies. Man I am trying my darndest to not get sucked into the cookie making machine that I want to be. Why am I resisting. Because I gain way too much weight when cookies and I meet up. But that doesnt mean I cant drool all over my keyboard looking at marvelous cookie creations! Okay I will stop talking, er, writing now. ok that sounds good to me. no need to kick this one up a notch. Love shortbread and these sound wonderful. I am adding this cookie recipe to my must try list.